When it comes to your wedding day, everyone wants beautiful white teeth. 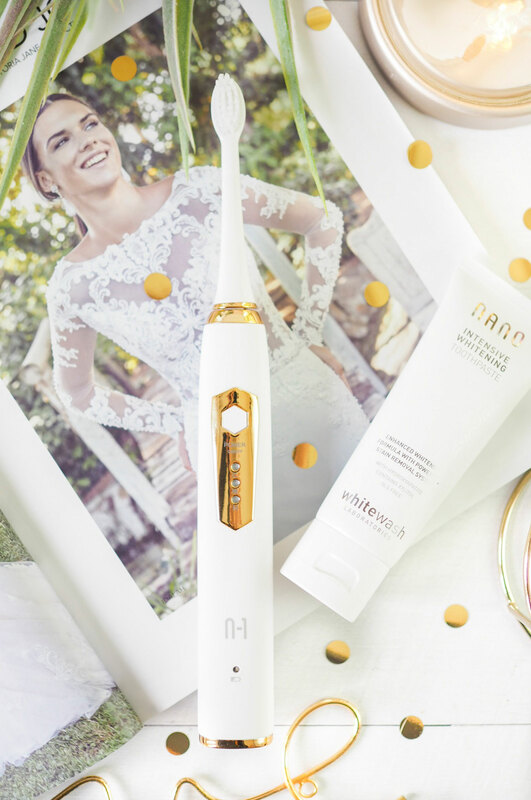 Whether you’re the bride, the groom or anyone else, you’re sure to be looking for the whitest teeth on the big day. 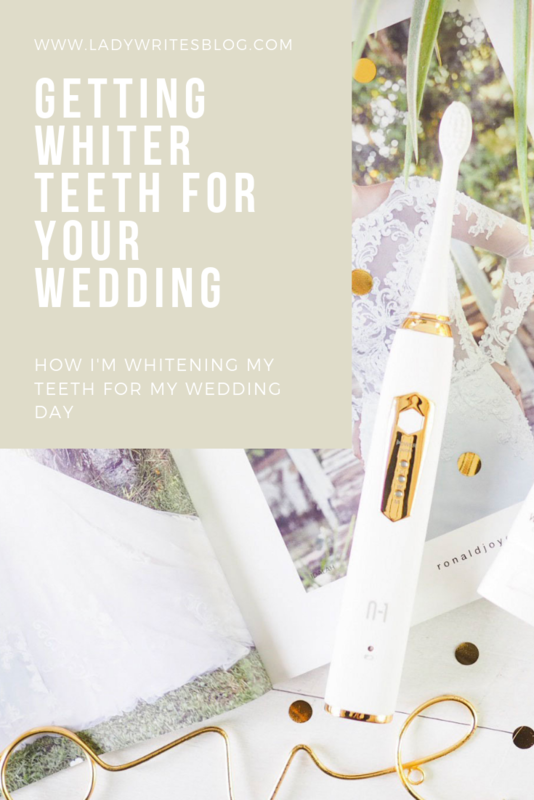 As someone who really doesn’t like their teeth anyway, it’s always been important to me that mine look their best on my wedding day and getting them whiter has been a big focus recently as the date creeps closer. The thought of smiling with a ‘teeth-smile’ on the day, has made me feel self conscious already, because of how much I dislike my teeth. As the day begun to get closer and closer I decided it was time to take control and get some help. I might not be able to change the shape of my teeth overnight but what I could do was whiten them and give myself a brighter and more clean smile for the day. When my teeth are whitened I have so much more confidence in my smile – who doesn’t? And I knew that whiter teeth was something I could achieve with WhiteWash Laboratories because I’ve used their products before. About a year ago I had tried several of their products and been really impressed with the level of whiteness I had been able to achieve from home. Having spent a silly amount of money having my teeth ‘professionally’ whitened once before, I was happy to say that my at-home experience was just an all-round better fit for me: financially, results-wise and it’s just so much more convenient. 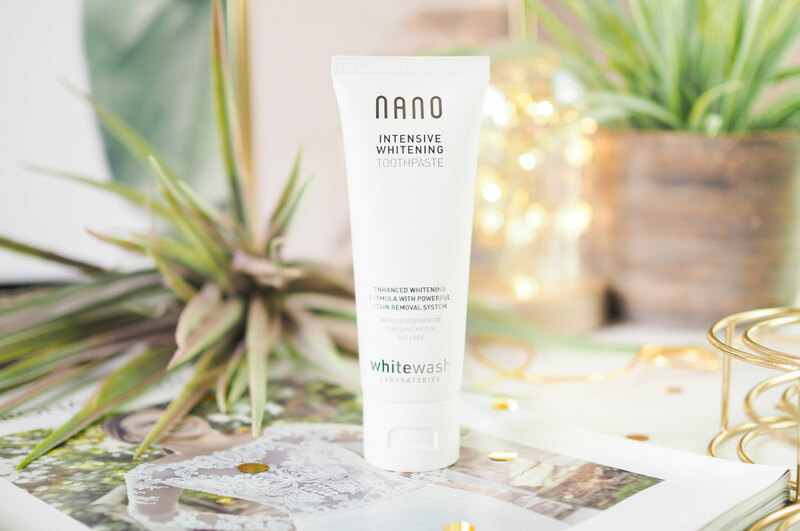 So when I knew I wanted to start the process again for the wedding, I knew the Nano Range from WhiteWash Laboratories was the place to go. For me, the basics of oral health are important aspects of teeth whitening anyway. I drink far too much caffeine every day and put my teeth through their paces, so I knew my smile overhaul would need to start at the very beginning of my regime. Which meant replacing my old toothbrush with the Nano Sonic Whitening Toothbrush. 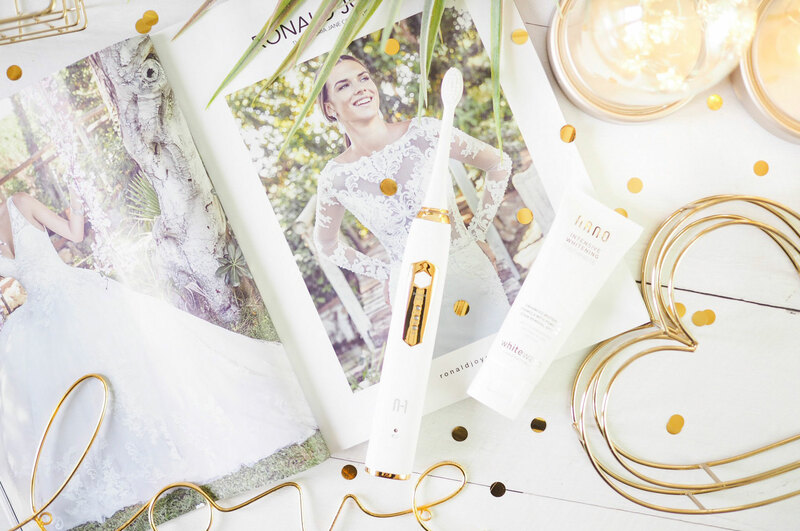 More than just a good-looking toothbrush (can we talk about how aesthetically pleasing the white and rose gold is?!) it gives a really thorough clean. It’s got this nifty 2 minute timer for your full brushing duration, and it’s also got a 30 second interval timer which indicates when it’s time to move to another section of your mouth – so all areas get an even clean. And the vibrations it creates lift away food, dirt and build-up, so your teeth not only look clean, but feel it too. 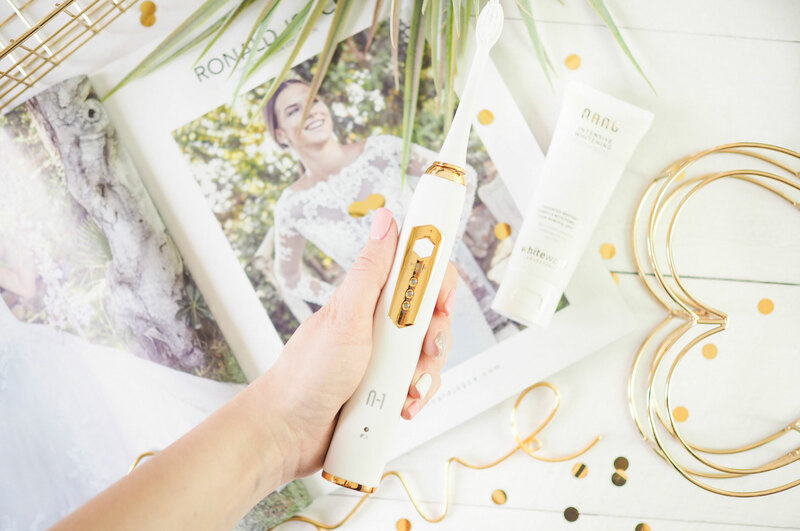 It’s so easy when you’re brushing your teeth and rushing about to not spend enough time cleaning, but the Nano Sonic means you can guarantee a thorough brush every time thanks to its three modes: clean, whitening and massage – the choice is yours depending on what you want. Brushing your teeth properly and thoroughly is the first step to a better looking smile and I have really enjoyed ditching my normal brush for this seriously snazzy electric number. In the hunt for a whiter wedding-day smile I switched out my normal toothpaste to the Nano Whitening Toothpaste too. Used with my Nano Sonic Toothbrush, it’s complimented by the matching mouthwash too – which I’ll chat through next. The toothpaste itself has been formulated by Dentists and contains a unique blend of whitening properties – so it’s trustworthy in source. I noticed within a week how much brighter my smile was looking with this. It was a subtle and developing change that’s still going ongoing as I continue to use it, but definitely noticeable. I started to notice that the end-of-the-day yellowing around my gum-lines was lessening when I began to use this and then brushing away what was left before bedtime completely removed the darker colour. For the first few days of noticing this, it was like a magic trick – start brushing with slight yellowing, end it with none. And that was something that gave me real hope for my wedding day. Used instead of normal toothpaste, it takes zero effort to slot into your routine. You literally do nothing different and notice benefits within a week or two. It’s one of those winning beauty hacks I’ll happily recommend! 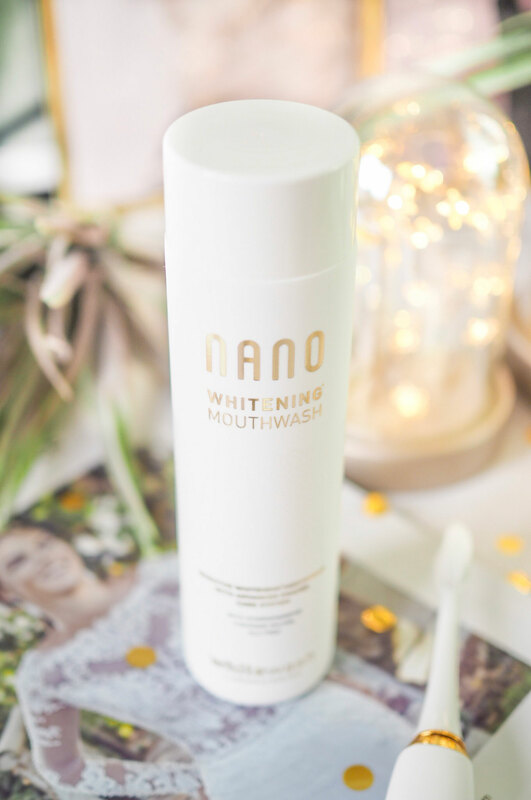 I’ve been using it with the Nano Whitening Mouthwash and together it’s given me so much more confidence in the way my teeth look and feel. It’s hard to describe how deflated a ‘bad’ smile makes you feel. Unless you’ve got teeth or a smile you dislike then you wouldn’t understand it, but we all have things we dislike about ourselves don’t we? And on my wedding day I didn’t want anything bringing me down or stopping me from bearing my biggest, happiest smile! And just these simple daily switch-outs to the Nano range have made the world of difference. My teeth feel cleaner and look several shades brighter already – which is priceless as a bride-to-be. When I started my pre-wedding smile overhaul I knew I had a few months before the big day to help me put into practice a long-term plan for my brushing habits with my new brush and products, so I was happy to take my time. 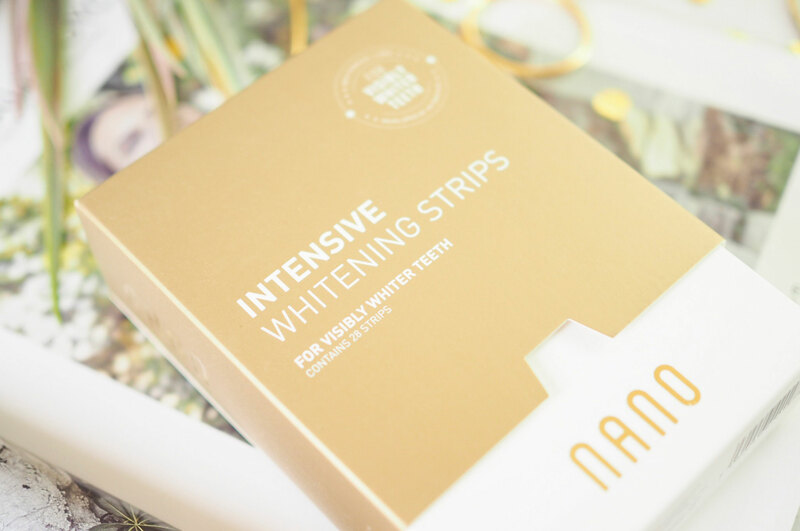 But about two weeks ago I also revisited the Nano Intensive Whitening Strips, which are one of the products I’d tried before from WhiteWash Laboratories and been really pleased with. These are tiny little strips you apply and stick directly to the teeth. Each pack comes with two strips – one for the top row and one for the bottom and you just apply them directly like sellotape. It takes a while to get used to them because you have to wear them for 60 minutes at a time, but after the first 10-15 mins you usually forget they’re there. I wear mine in the afternoons while I’m working on the computer so I get distracted in my work and just set a timer to remind me to remove them. Each box comes with enough strips for a month – 14 packs to be used every other day. Because I’d used these before I knew they were safe for the enamel on my teeth – which is usually the biggest concern with strips like these. But because WhiteWash Laboratories have Dentistry at their roots, you know your teeth are in safe hands – and these are safe for the enamel. (They also taste like mint so that’s a bonus!) Results-wise I noticed results immediately. Once you start using these you’ll be able to spot a real whitening after just the first strip. It took a few days for me to even out the tone across my teeth as a whole – but when I did, I was so impressed to find that my teeth were looking the most white they’d ever done without someone else doing it for me. My opinion on these is that the’re going to give you that professional level of whitening you want to go several shades whiter with your teeth. The everyday basics like the toothpaste and mouthwash are great and easy to use as maintenance or if you’re looking for a subtle, slow change. The strips on the other hand give more visible results much quicker, so if you’re looking to whiten your teeth for something with only a brief amount of time, then these are for you. As a bride-to-be preparing for my wedding day, together these have given me the best of both. My everyday habits have now improved and are helping me to maintain the new level of white I have achieved from the strips. I can say I’m already a good few shades whiter and a lot brighter in appearance, while still looking natural and I still have a month to go before the big day. 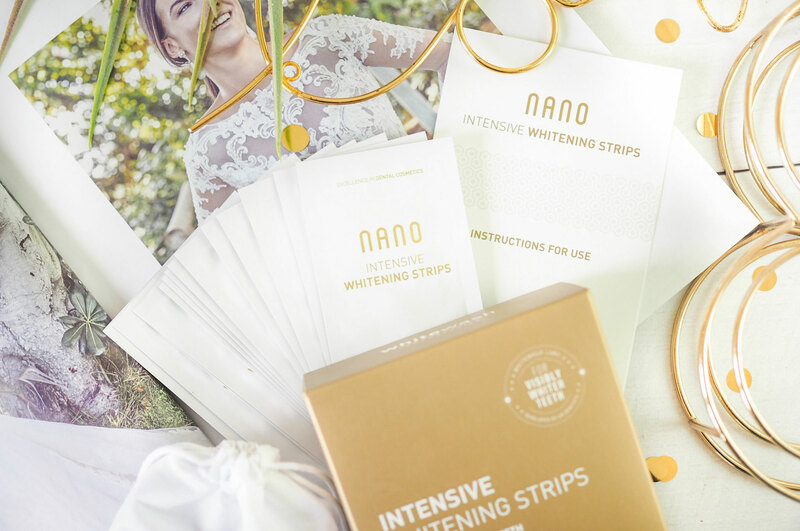 I’d recommend the Nano range from WhiteWash Laboratories as pre-wedding whitening to all who are looking for easy and convenient teeth whitening system before their wedding. And anyone else really! Get 10% off all Nano orders from WhiteWash Laboratories with code: Ladywrites10 at the checkout! **This is a sponsored post in collaboration with WhiteWash Laboratories but as ever all opinions are entirely my own. Please refer to my Disclaimer page for more details. I’d happily buy the toothbrush for its looks alone, it’s so aesthetically pleasing! I drink so much coffee through the day, I really do need to invest in something that can protect the colour of my teeth, and I think this could well be it. I’m so excited to see the photos from your big day, and I’m sure you’ll look absolutely stunning with a beautiful bright smile! I’ve heard so much about this brand! They sound amazing! I love this brand, I really love their whitening strips. Ive such good things about nano, my friends uses them! Might have to try it!